Looking for a Caterer? Start Here! Q: Should I hire a caterer? 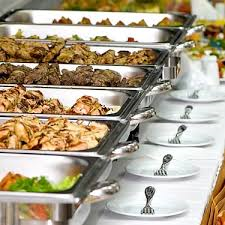 A: If your reception facility does not provide food, you will need to hire a caterer. The caterer will be responsible for preparing, cooking, and serving the food. Hiring a caterer is an investment that will save you time and money. The best part is that it will allow your family to be guests at your wedding instead of cooks and wait staff! 1. Given the style, time, and date of my wedding, what are some menu items that you suggest? What would the cost-per-person be? 2. Do you have any particular style of food or special menu items that you specialize in? 3. How many other weddings will your company handle that same weekend/day/hour? 4. Are you licensed? (this means that they have met health department standards and have liability insurance)Do you have a liquor license? 5. How does the cost-per-person of a buffet compare to that of a sit-down dinner? 6. Does that cost-per-person just cover the food, or are charges such as staff, rentals, and linens included? 7. What service costs are included and what costs are additional? Are set-up and clean-up included? How much is overtime if the reception runs long? Are gratuities included? 8. Do you provide linens, glasses, plates, silverware, tables, chairs, serving pieces, and decorative flowers for trays? Would it cost less if I handled any or all of that myself? There are several other very important questions that you will need answered before making an informed decision. You will also need to make sure that your contract covers everything discussed by you and the caterer. Don't do it by yourself!! Contact Myiesha at Kiss and Tell Weddings for assistance!